The Kansas State Capitol, located in Topeka, Kansas, was built between 1866 and 1903. 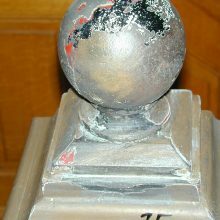 Over the following one hundred years the building’s historical and architectural integrity was threatened by practical considerations, such as the need for more office space, modernizations in lighting and climate control, and a lack of understanding about the structure’s needs. 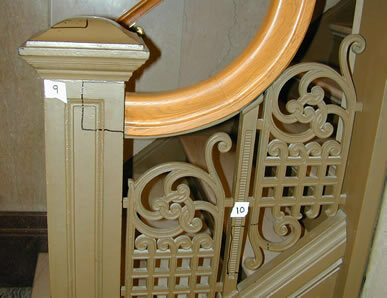 As a result, much of the building’s decorative wood, metal and stonework had been over-painted. 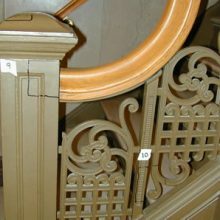 We were hired to determine the original appearances of select areas of decorative metalwork located throughout the building. 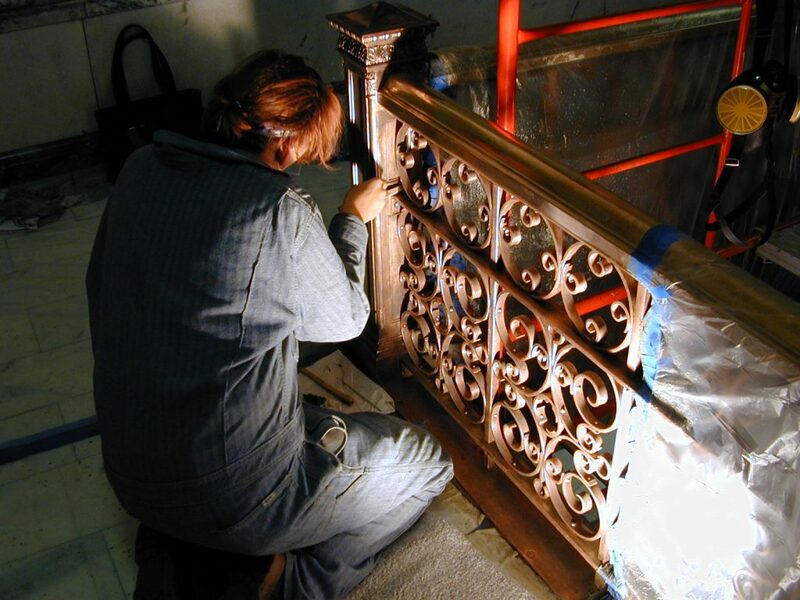 Our investigation revealed that many of the areas in question had been coated with a wax coating, probably used as a protective barrier at the time, which had darkened in color over the years and obscured the metalwork’s original appearance. Other areas had experienced multiple layers of over-painting. 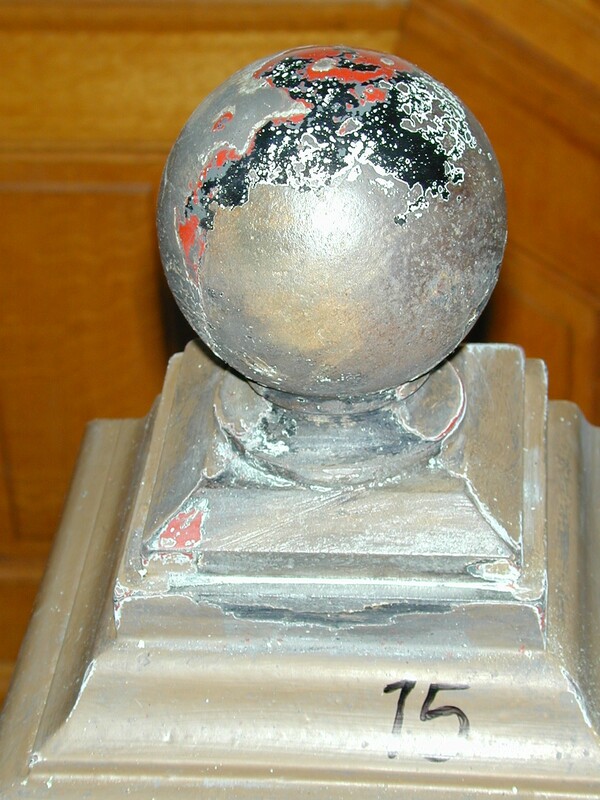 Areas that had remained free of any coating or over-painting, but were exposed to excessive handling, were usually worn down to bare metal or suffered from some degree of corrosion. 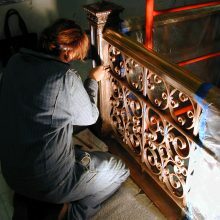 Our conservators reviewed historic documentation and performed in-situ sampling in order to determine the original appearance of the metals, find the proper techniques to remove coatings and paints applied to the sample areas, determine the nature and cause of the corrosion, find the proper techniques to safely remove the unwanted corrosion products, find the proper patination solutions to match the original patina color, find the proper coatings to match the original finish, repair areas of missing original plating through in-situ brush plating, design and specify a conservation treatment, calculate budgetary costs and time estimates for the project, and finally, to provide a written report of all findings with photographic documentation.